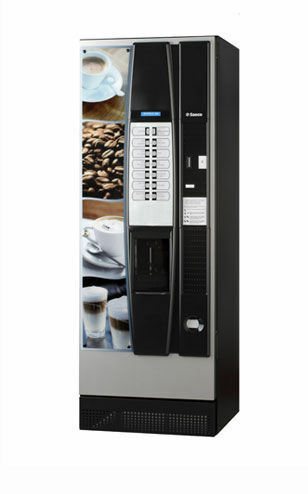 We offer you the SAECO range of Coffee Vending Machines. Most of our owner operators use them just because of their great features. Mainly because of the elegant, compact and high-tech design, the Saeco is a top coffee vending machine, great for small / medium locations, offices and showrooms. Your workplace will benefit from having one! Main features of the Saeco Vending unit is an excellent brewing unit of top quality Italian manufacture, a maufacturer who knows how to make a quality espresso, using the Saeco pre-heating system for brewing with high capacity canisters and easy cleaning and maintenance. See our usage of the Saeco International Group because they undertake to produce high quality vending machines capable of providing people with an improved, more pleasant and simpler life. Like our owner operators they are "driven by the goal to provide connoisseurs with the most authentic café experience at the office or workplace or even home ... that's why they invented the fully automatic coffee machine, more than 20 years ago." Time and time again they have redefined the coffee-at-the-office experience, always searching for the next ground breaking idea – and always finding it. With a Saeco coffee vending machine you can experience the real Espresso feeling. Saeco responds to all consumer needs and finds innovative solutions for design, production, after-sales service and marketing. If your need a great tasting coffee for your workplace or office chose us to organise and supply your business with a great coffee machine and let our operators give you their best Coffee Vending Service! * Ability to take coins & notes ($5.00 & $10.00) Simple to operate.